Red Cup Party ideas. 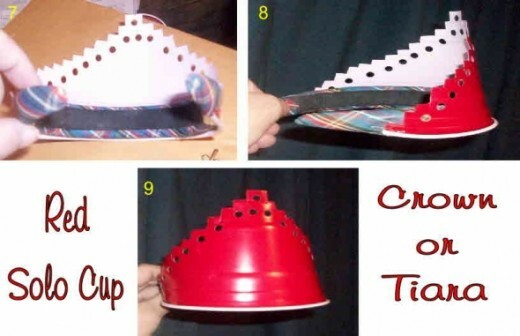 How to make crafts and decorations using solo cups. Get instructions for the Red Solo Cup Line Dance and a Red Cup costume to go with with it. See the original video for ideas on how cups were used and go to my instructions on how to make them. 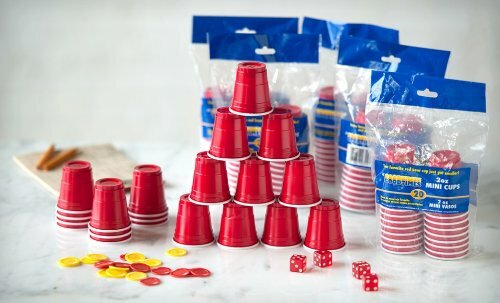 Find party supplies for a Red Solo Cup party. Have a look at the video and keep an eye out for cups everywhere. You will see them hanging from the ceiling like a beaded curtain, made into a camera and worn in peoples hair for example. Wow, that's an easy one. You will need some red cups. Try to find the original Red Solo Cups if you can. They are round and work better for making things. A new version of the cup is squared off. If you can't find those, I suggest substituting a different brand of red cups that are round for making your projects, but you can get the round ones here online. The cups shown above are the standard sizes for theses cups. 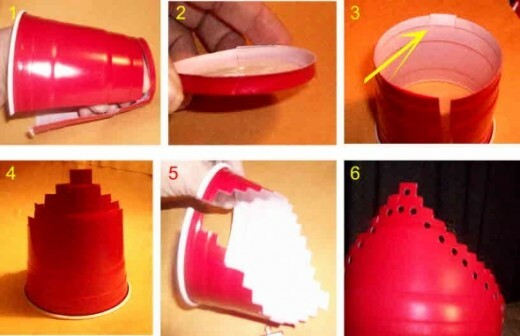 There are some others that I will show you as well, but first, lets see some ideas for using cups at your party. One of the most popular things to do using the cups is to make string lights or patio lights. You can do this with a regular string of Christmas lights. Here are the instructions to make your own party lights. If you are not into the whole crafting thing, Red Cup Party Lights are available already made. Mix them in with your Christmas garland, streamers or use them just as they are. This picture on the right closely resembles how the cups could be made into a wreath also. You would need a wreath frame or garland wreath to attach them to and of course you can use them on a Christmas tree also. This is a set of mini cup lights that comes with 30 lights on a clear string wire. They are about a shot glass size at 2". This is another battery operated set that includes 12 cup lights. to your outfit when you head to the party. Save the bottom circle that you cut from the cup. You can use it to make some earrings by gluing an earring back to it or just punching earring straight through. 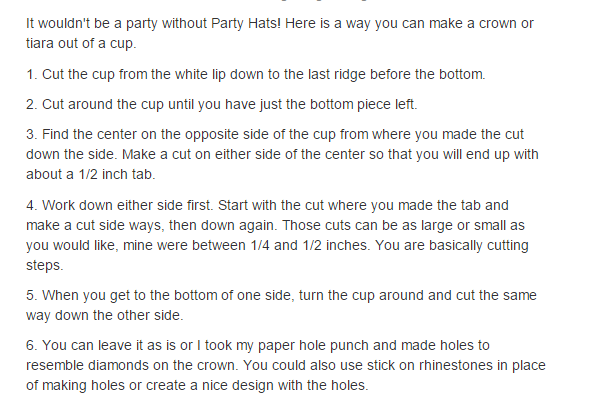 Here are a couple of things that you can make from cups that you will be able to use as decorations for your party. One very easy thing to do is to make the strings of cups that hang straight down like a curtain. You may have seen these in the music video. First decide how long you want your string of cups. Measure off a length of string that you need and allow a little extra for hanging and making knots. 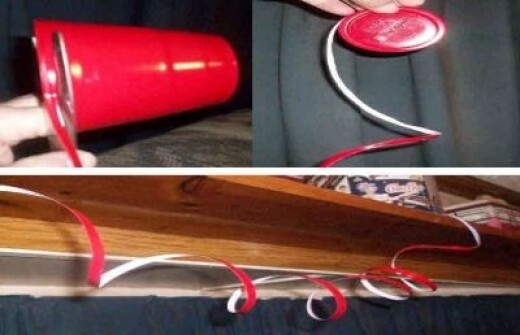 Simply poke a small hole in the bottom of the cup and run the string through it. You will need to stop after stringing each cup to tie a double knot to hold each cup in place. Hang 5 or six sets of these in a doorway or entrance. can use for decorating. As you can see in the picture, you are going to end up with the bottom of the cup left over when you finish cutting. Save that to make the earrings that I showed above or maybe add a craft pin or velcro dot to the back to make name tags for your guest. Here are the instructions on how to make flowers out of plastic cups. I know that Red Solo Cups are widely associated with drinking games, but it is not necessary to use beer, shots or any type of alcohol. For kids or anyone who doesn't care to drink, you can always substitute kool-aid or soft drinks. Take you party games to the pool during the summer. There are cool pool floats designed to play beer pong or to just relax on and have places for you drinks. These are available with or with out a cooler. The good thing is that you could use this in the water or not. Use on top of a table for more fun and games out of the water. It will be much more portable than a wooden pong table for taking along with you. This is wonderful for having fun on the water. You can use it for a regular float, play games and keep you drinks cold in the build in drink cooler. The party barge is 6 feet long and 3 feet wide and will hold up to 18 drinks with ice. 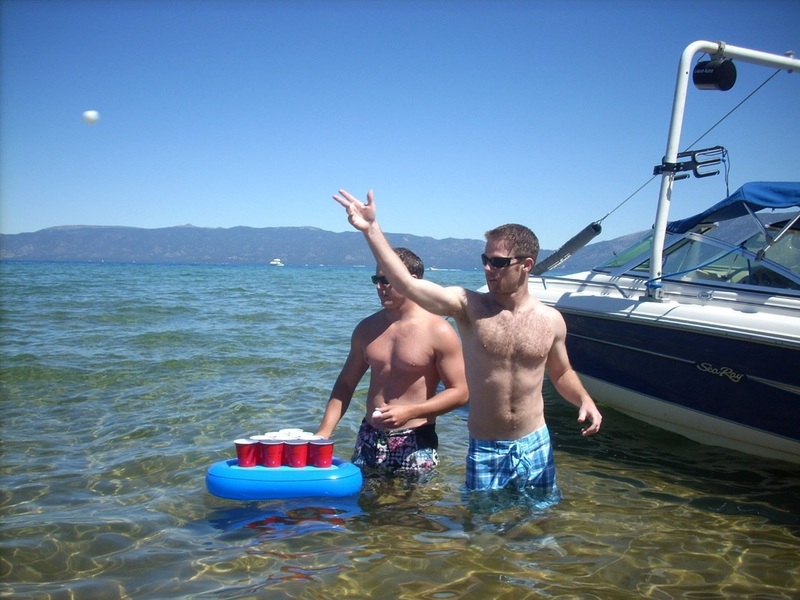 Individual floating rafts designed to hold cups for games or drinks for all. Jimmy Fallon loves to play games with the guest on his late night talk show. It seems like every time I watch, they are doing something with Red Solo Cups. Besides beer pong, I have seen him play flip cup with many guest and once I saw them play musical beers with cups. The first video shows them playing flip cup for the holidays. Play it plain or add a colorful twist for other holidays like the did here. How about some prizes for your party games? While in the process of cutting up cups, I ended up with something that reminded me of award ribbons. I worked that into these ribbons in the picture just using some of the steps I used to make the flowers. Below are some additional ideas on what you can do with the ribbons. red baking cups for your cupcakes or for servings of nuts or mints. Then there are red cups with a stem for anyone who doesn't want to give up their wine glass. Sound Like This Could Be A Fun Party! No, this is not the end of the story. Just a short break so you can fill up your cup if you need to before we continue. Not a problem. Let me give you a couple of ideas for a Red Solo Cup Costume. Either of these two would also be fun to wear for a beer pong party. You could create something similar to the red dress using a red spa wrap and add some white craft ribbon to it. I have also seen a homemade costume similar to the cup costume using a large plastic garbage can with the bottom cut out and spray painted red. You will then need to attach suspenders or something to use as shoulder straps to hold it up. Another fun accessory for your costume are these beer hats like the ones worn in the video. They come in cowboy hat and construction hat styles. You will never again have to sit your beer down while you dance! use ping pong balls for a toss game. If you want to do a little dancing to this song also, there are line dances that you can learn. In the following video you will be shown the steps and a demonstration. The second video will show you how this can look as a group dance at a party. I hope you have found some useful and fun ideas. Thank You for stopping by.